Welcome back for another edition of Whom Pods Destroy, a Star Trek Discussion podcast. The topic of this edition is the 3rd season episode Is There In Truth No Beauty? 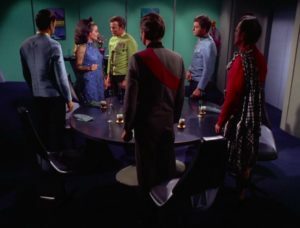 There were many constraints placed on the writers and directors in the third season on Star Trek the original series. This frequently led to a number of poorly and thought out stories made on a small budget. But there are a number of episodes from this season that take advantage of their limited resources to produce imaginative and challenging stories with interesting effects camera angles and photography. Is There In Truth No Beauty? is one of the best, if not the best example of this. Join Terry, Derek and Graham as we discuss the story of Dr Miranda Jones and Kollos the Medusan in this story of beauty, ugliness, madness, jealousy and infinite diversity in infinite combinations.